The North Carolina Basketmaker's Association Convention! 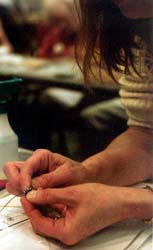 I am a self-taught coiler, with few basket classes in my area. This was my second year attending NCBA, and I looked forward to coiling classes, but this was the only one: tiny single rod coiling, by a teacher with whom I was unfamiliar. 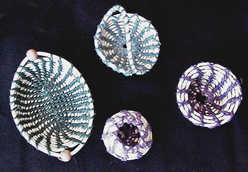 You probably know what reactions are to coiled baskets: "They are lovely but don't expect me to make one." Yet, the class was full, and every time someone walked by, she would gasp, and pick up one of the teeny tiny samples, and say, "do you sell the pattern?" It must be the reed, I decided...something about seeing reed made into a coiled basket makes it more attractive, or look easier. These were hot little baskets, now. They were sold by the instructor at $15 apiece last year during the Teachers' Marketplace, and were so popular, she decided to raise the price. Coincidentally, $15 was also the materials fee for the class. Each pattern bag had three colors of waxed linen, (eleven foot pieces - try pulling THAT through a teeny tiny basket!) four pieces of #1 round reed, a needle and instructions. We were loaned a tiny copper clip, to help with the "start". My class schedule had been filled with twining and straight weaving, and I was eagerly anticipating this class. With little to no experience in those techniques, I made an attempt to follow the instructions, but inevitably got something wrong. By now, I was quite accustomed to the teacher saying "let me see that a minute", and redoing everything I had done. I was really looking forward to being the one who knew the basics in this coiling class, and not requiring as much teacher attention, if you know what I mean. The instructor is, I think, a very good teacher, but she was not a particularly experienced in this technique. 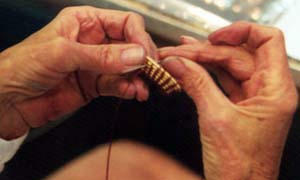 After taking a single class with a sweetgrass basketmaker, she developed this tiny reed coiling application on her own. What she developed for this class, adapting familiar and attractive materials to a generally avoided technique, was clever. It probably took a long time to perfect the concept. But executing a small basket in round reed it is not that difficult, if you have a basic coiling technique down already. I am accustomed to working small, so it was not that far a leap for me. But most of the students had little experience coiling, were all thumbs getting it started, and proceeded with deliberate caution. Helpful tips, generated by the class at large ("use the pliers to make the start"..."poke your needle in from the front if you have difficulty figuring out where it should go from the back") were not passed on by the teacher, which disturbed me. Each person struggled on their own with the minuteness of the initial coil. The pattern, in comparison with the others I received, was marginal - large paragraphs, drawings difficult to interpret. The eleven feet of waxed linen was definitely difficult to manage. The designs are very simple, but difficult to execute with the pattern alone...a photograph or finished sample of the hurricane handle and the bead handled oval basket really were required in order to understand how they were constructed. The istructor looked at what I was doing on her first trip around the group, and told me to change the way I was stitching. Great! I need to learn new stitches. This pattern used the separate stitch, though it was not particularly well-described - ever done it? Very simple, perfect for single rod coiling. Made everything easier. This, alone, made it worth my taking the class. It took me less than an hour to complete the first basket. We were told all three baskets were to be made in class. Honestly, I made them all, but I think I was the only one. Just about everyone finished one, maybe two. To my knowledge, there is no one else teaching single-rod coiling, and this is a real innovation in coiling classes, as I see it. The teacher, however, is not comfortable having experienced coilers in class. This was evident when I finished my first basket by the time she made the rounds of all the participants once. I don't really appreciate being called "Ms. Over-Achiever", but perhaps it would not have bothered you. There was enough time left that I made a fourth basket, in a different shape. This was greeted with what can almost be described as defensiveness by the instructor...really, I felt like I had intruded on her turf by making another one. I don't think I would have come up with this coiling application on my own, and am glad I took the class, but would have liked to have left with a friendlier feeling.